If you are on a shoe-string budget, getting a chair that will neither break your back nor your bank, can be a challenge. 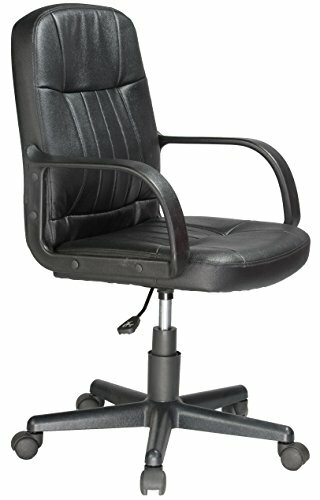 A majority of the office chairs in the sub $100 range are poorly constructed; thus, uncomfortable to sit on, especially if being used for prolonged periods. And that’s not all; these chairs break down easily, so you end up dumping them in your garage or basement. In which case, you will not be saving any money but wasting it. 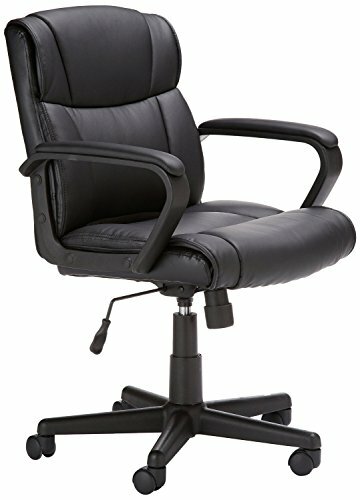 Is it possible to find a quality office chair for less than $100? Yes, it is. You just have to do a lot of research, separating wheat from chaff. Fortunately for you, we have done all the leg work of researching. 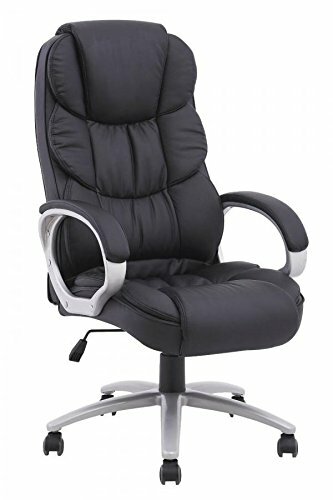 Below is a detailed review of the ten best office chairs under $100. Our top choices are the Flash Furniture Executive Swivel Chair, the BestOffice Ergonomic PU Leather and the Techni Mobili Office Chair. Why we choose these as the best office chairs is because they strike a good balance between price and quality. They are affordable yet they still have features that you’re likely to find in pricier high-end ergonomic office chairs. Although their maximum weight limit is 250 pounds, these office chairs will give you years of use, making them worth your investment. When buying an office chair at this price range, remember that these chairs won’t have all the features you’d find in pricier models. But this does not mean that they won’t be comfortable to sit on. The secret to choosing a quality office chair under $100 is to compromise on the features you can do without. For instance, if the design is not an important factor to consider, you can choose any chair as long as it has an ergonomic design and offers durability. 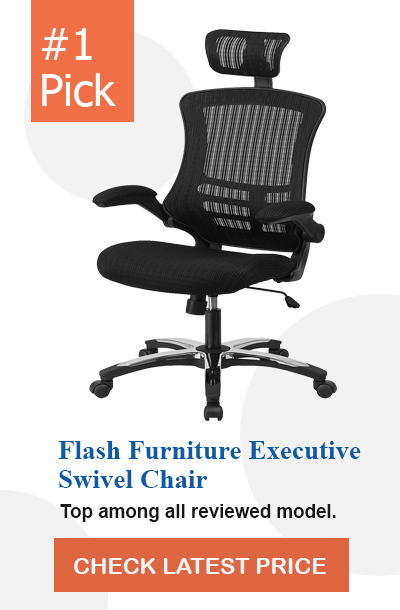 If you’re looking for a simple ergonomic office chair that provides decent lumbar support, then there’s no better model than the Flash Furniture. 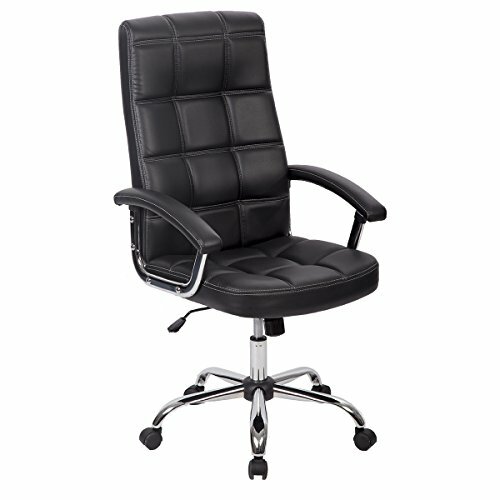 This office chair is available in black, black leather and black mesh designs. It’s a type of high back chair that comes with an adjustable headrest. It also has flip arms and a chrome-plated nylon base, giving it a modern appearance. But the key highlight of Flash Furniture is its mesh padding. The mesh material provides maximum breathability; thus, helping to circulate air and keep you cool. Furthermore, it has a pneumatic adjustment lever that enables you to make height adjustments. Padded armrests that are retractable to save on space. Chrome plated base for a stylish look. Some customers complain of the fabric being too rough. Armrests are not height adjustable. The Flash Furniture is the best office chair if you want to maintain your posture, thanks to its sufficient lumbar support. Not everyone fancies a mesh office chair. There are those who are hell-bent on getting leather furniture. If you belong to the latter group, then you’ll want to go for BestOffice Ergonomic, which is the best in the category of leather office chairs. BestOffice is a budget ergonomic chair constructed using water-and-oil resistant PU leather. This causes the chair to exude sophistication, making it the perfect chair in the corporate world. Although the material is comfortable and low-maintenance, it does not offer as much breathability as the mesh design. Another plus of BestOffice is that it comes in a range of sizes and colors. You can get in size 1, 2 or 5 and colors: black, brown and white. The seat of the chair is 20 inches wide and 20 inches long. The height can be adjusted between 19” and 23”. Made of PU leather which is resistant to water and oil. Is sturdy and provides excellent back and arm support. The armrests and backrest are not adjustable. The base becomes imbalanced at higher weights. If you’re looking for a relatively bigger mesh office chair than our top pick, your best bet is Techni Mobili. It has the same mesh design as Flash Furniture, meaning that it offers similar breathability. The difference with Techni Mobili is that it has a larger seating surface area, measuring 25”W and 28”L. On the downside, the chair has a small weight capacity of just 220 lbs. However, there are other features we like about Techni. For one, it’s available in black and blue colors. Very few manufacturer make office chairs in bold colors such as blue, so this is a plus on its side. Also, the chair is fitted with a large nylon base and non-marking nylon wheels. The wheels make the chair ultra-stable and mobile. Comfortable and molded flip up arms. The nylon wheels improve stability and mobility. Complaints of the armrests becoming worn out too fast. Does not support much weight. If you don’t mind the 220 lbs. weight capacity of the Techni Mobili, then this chair is generally a good option to consider. Mid-back office chairs are great because they support the natural curve on your spine. AmazonBasics Mesh Chair is the best in the mid-back chairs category. The AmazonBasics black office chair helps you to incorporate style into your at-work space or home office. It has a mesh design to keep you cool and it’s fully adjustable. It’s fitted with a pneumatic control that lets you raise or lower your seat to whatever level you want. Another plus of the AmazonBasics entails the dual caster wheels that enable the chair to swivel; hence providing multi-tasking convenience. This chair is 25.2 inches in depth, 24 inches in width and an adjustable height of between 35.6” and 40.3”. It can support a maximum weight of 225 pounds. Amazon provides unparalleled customer service. Low maximum weight limit of 225 pounds. The AmazonBasics is the best mid-back office chair you can get on the market. It boasts a mesh design and dual-wheel caster to improve mobility. The PU Leather Ergonomic Chair is designed for that individual who works 8 to 10 hours each day. It has a ton of handy features that make it comfortable to sit on for a prolonged period. Fabricated using PU leather, this office chair is certainly one of the most comfortable. In fact, it’s described as a computer chair, and is available in black and brown colors. Unlike the AmazonBasics, this one supports higher weight capacity of about 250 pounds. Another area where this chair stands out is in its assembly. You will spend 15 minutes at most to put this chair together. This is an important feature if you’ve bought several chairs for your office and have to assemble them on your own. We also like that the manufacturer provides 1 year warranty. Maximum weight limit of 250 pounds. Does not produce noise when moving. Not designed for heavy users; tends to tip over. If you weigh no more than 250 pounds and have to sit behind a desk for long hours, the PU Leather Ergonomic Chair by BestOffice does not disappoint. Amazon is one of the most trusted brands, which is why we have another of their office chairs appearing in our top 10 list. 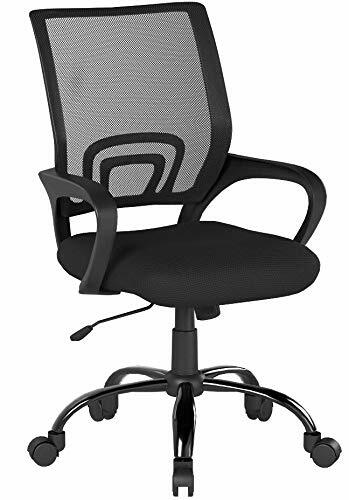 For individuals who only shop from reputable brands, you couldn’t go wrong with the AmazonBasics Mid-Back Office Chair. While the previous Amazon chair that we reviewed features a mesh design, this one is constructed from high-quality leather material. In fact, the manufacturer uses smooth, supple, bonded leather when making the padded seat as well as the back. The armrests, however, are made of textured nylon to provide support and comfort. It’s also a mid-back chair, meaning that it supports the natural curvature of your spine. And it also has dual-wheel caster that guarantee smooth rolling. Comfortable office chair that is upholstered in high-quality leather. 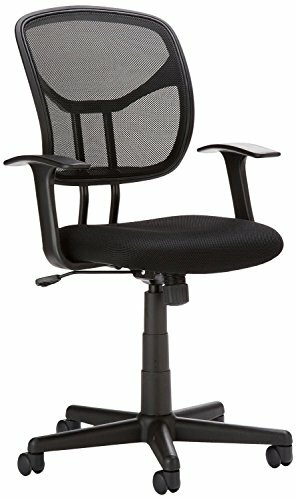 The AmazonBasics is a good office chair offered by a reputable brand. This means that you can rest assured as it’s made of only the highest quality of materials. Are you looking for an office chair that can double up as a gaming chair? If you are, the OFM Essentials makes a strong contender. There are several features you’ll love about the OFM Essentials. One is the integrated headrest that is constructed using leather so as to minimize strain on your upper body and neck. Secondly, this chair has high-quality foam padding on the seat, to keep you comfortable all day long. According to the manufacturer, the chair has been subjected to a 300 lbs. drop test and found to have superb frame strength. This means that the OFM Essentials not only supports your weight but it also holds up. However, take note that the recommended maximum weight capacity is 250 pounds. Apart from the drop test, this chair is also taken through 100,000-time tilt test. So you can use it with all the confidence knowing that the chair’s mechanicals are thoroughly tested. Has a flip-over footrest that supports your lower limbs. Has undergone several tests to verify its efficiency and durability. It’s a heavy chair, and this can limit its portability. For a versatile furniture that can also be used for gaming, there’s no better option than the OFM Essentials Leather office chair. It offers miles of durability, excellent frame strength and mechanical longevity. Even if you have a small budget of less than $50, you can still get a quality ergonomic office chair like this one by Comfort Products. This chair is available in two main colors: black and brown. 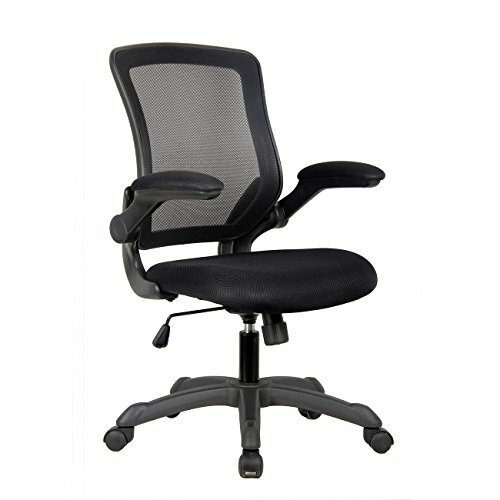 It’s an example of a mid-back office chair meaning that it’s designed to correspond to the contour of your spine and back. Another feature that sets this office chair apart is its contemporary cushion design. Constructed using leather, the design also consists of waterfall-style padded armrests that connect to a durable nylon base. 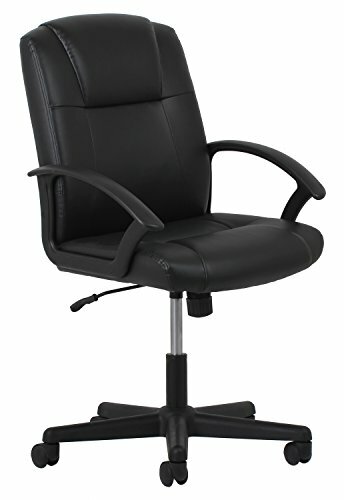 Also, the Comfort Products Office Chair boasts an adjustable height and reclining capability. There’s a control below the cushion that allows you to change the chair’s tension, lock, swivel and height. Has molded loop armrests that relieve shoulder tension. Has a medium-height back covered in supreme leather material. The multi-purpose leather office chair by Comfort Products is a great option not just for your office but also your toddler’s study room. BestOffice has proven to be on the cutting-edge when it comes to designing office chairs, and the Ergonomic Mesh model is no exception. The first thing you notice about this chair is that it comes in packs, which are very economical. This particular product is 1-pack chair, but you can also purchase 2-pack, 3-pack, 5-pack up to 100-pack chairs. What’s more, this chair has a very easy assembly. Since the manufacturer provides all the tools you’ll need, the installation will take you less than 10 minutes. 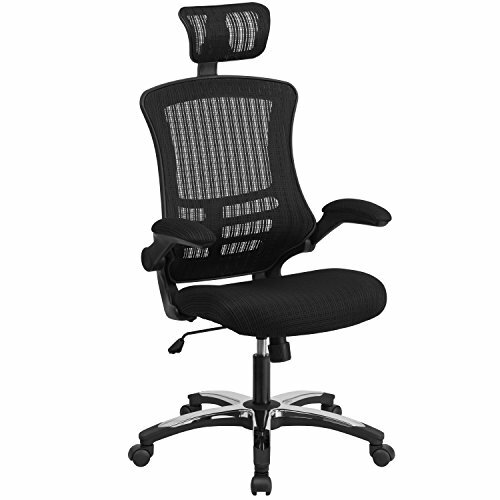 Ergonomic Mesh is a durable chair that you will use for years. All its parts are BIMA certified, so you can rest assured that it’s durable. However, it should only be used by persons weighing 250 pounds or less. All parts have BIMA certification. Available in different packs of 1 to 100 chairs. Has a heavy-duty metal base to guarantee stability. The armrests can turn out to be too low for tall users. Do you prefer office chairs that have no armrests? If you do, this office chair by BestOffcie is a good choice. As with other office chairs from this brand, this one also uses parts that have BIMA certification. This means that you can rely on the durability and stability of this office chair. Also, it’s possible to adjust the height of the chair to match your needs. BestOffice Home Office Chair also offers a 360-degree swivel capability. The fact that this chair has no armrests, makes its installation one of the easiest. On the downside, most individuals prefer to use office chairs with armrests to support their arms. To compensate for this, BestOffice has used an ergonomic design on this chair, making it extra-comfortable. Ergonomic design making it comfortable. We are a team of experienced researchers and analysts who scour the internet to find the best products. To come up with this list, we spent more than 30 hours comparing and testing different chairs priced under $100. We also interviewed consumers to determine the features they value the most when purchasing a chair. Thus, we concluded that most buyers focus on ergonomic features, adjustability and weight limit. Each of the chairs in our review provides superb comfort, has a few adjustable settings and a reasonable maximum weight limit. 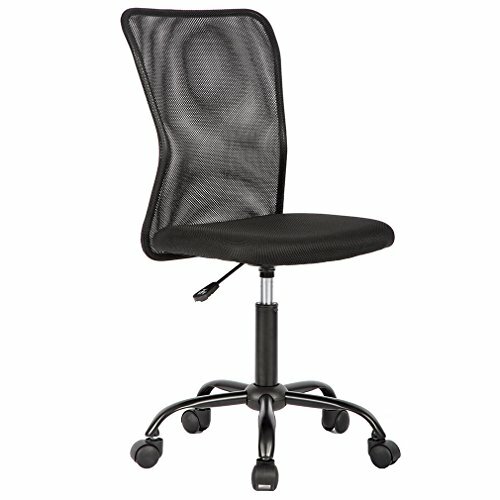 Mesh Chair vs. Leather, Which One Should I Buy? There is no distinct winner when it comes to choosing between mesh chair and a leather one. Ideally, it depends on the features that matter most to you as each design has its fair share of merits and drawbacks. For instance, if you primary concern is comfort, then a mesh chair is the best. The mesh design allows optimal breathability and this keeps you cool and comfortable. Leather chairs, on the other hand, are not forgiving to sweaty palms and arm meaning they’ll leave you with sweaty smears. But when it comes to durability, a leather chair is known to last longer than its mesh counterpart. If you maintain your leather chair, wiping it every once in a while, it will last for years to come. The same cannot be said for mesh chairs, which begin to lose their firmness and shape when they’re subjected to constant contact and friction. 5 Ways you’re Sitting Wrong at Your Desk. A grand mistake that workers make is to sit up straight on their office chairs. Although this usually feels like the right way to sit on a chair, it’s not. Well, overtime this sitting position places excess stress on your spinal system because you will always be trying to hold yourself up. Instead of sitting up straight, you should recline the chair slightly so that the back part supports most of your body weight. What is the first thing you do when you sit on your office chair? If you’re like most people, you probably configure the seat’s height so that your feet are resting firmly on the ground. This is wrong. Instead, you should make the height adjustment depending on how far your keyboard and mouse are. This way, your hands and wrists will be aligned correctly to the position of the keyboard and mouse. If you adjust the chair’s height in this manner and find that your legs are too short to reach the floor, you can use a footrest to support them. Many are likely to disagree with this point. Built-in drawers are handy storage units where you can store your files, stationery and so much more. These drawers are great, but they also prevent you from sitting in the right position. If you’ve adhered to the previous step, then you’ll notice that there’s just a small space between you and the desk, and this is not enough to incorporate a drawer. When typing on your keyboard or operating the mouse, your arms ought to be floating over the desk instead of resting them flat on the surface. Unfortunately, most people can’t keep their arms in this position for too long, which is why they opt for wrist rests. The problem with using a wrist rest is that it places unnecessary strain on your wrist nerves and veins, which are responsible for efficient blood flow. Rather than supporting your wrist, you should be supporting your palms as they are less sensitive to the pressure of keeping your arms in place. One misconception among workers is that standing for too long is better than sitting for prolonged period. This is incorrect. Standing is just as bad as sitting behind your desk all day long. The better option is find a good ergonomic chair and work when you’re seated. To prevent the fatigue that comes with sitting for too long, you can change up your position at times. You can walk away from your desk and grab a snack, adjust the recline position, move the footrest, stand for a short time and more. A common complaint from office workers is that their chairs keep sinking. Fortunately, it’s easy to fix this problem using a clamping down technique. All you need to do is to tighten the hose clamp, which is usually placed on the cylinder found under your chair.Alternatively, you can use a tube. With this approach, you will need to slit the rigid tube and clamp it into place at the top and bottom using two clamps. Both of these methods will prevent your office chair from sinking. Even if you’re setting up an office on a limited budget, there’s no excuse not to get an ergonomic chair that will provide good body support. All the chairs we’ve reviewed cost less than $100 and they give you excellent comfort and support.